10 Word Description — The most complete, compact multimedia studio in the world. 25 Word Description — TriCaster Mini lets anyone use everyday camcorders to create and publish video content in minutes, stream it live, and make ordinary presentations extraordinary. 50 Word Description — For people who want to use everyday camcorders to create and publish video content quickly, stream it live from anywhere, and make even the smallest presentations captivate audiences like network-style TV, TriCaster Mini is a compact multimedia studio with the most complete set of creative tools integrated into one small package. 100 Word Description — You don’t have to be a video expert, own a studio or expensive broadcast cameras, or know your way around professional equipment to create great multimedia content quickly and stream it live in minutes. 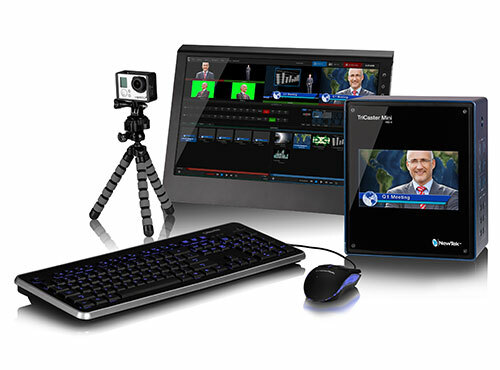 TriCaster Mini is a compact multimedia studio with a complete, creative toolset that lets anyone using everyday camcorders turn even the smallest productions into engaging video content for screens and audiences of all sizes. With a simple setup, familiar A/V connections, and a user-friendly software interface, it’s the fastest, easiest way to create, publish and stream television-quality video content from the office, an event or from anywhere.